My Little Corner of the World: A Bunch of Acting-Related Updates.... Plus More Bill Murray! A Bunch of Acting-Related Updates.... Plus More Bill Murray! So I thought I'd pop in with a quick update on all things acting/writing related of late. There's a lot! Ready? OK, so in the previous post, I mentioned I would be attending a local SFF convention here in San Diego called Westercon, where we would be doing a Q&A on our web series Origin: Beyond the Impact. But we were undeterred! We showed an extended BTI trailer, talked at length about the project, answered a few questions, and then showed the first 15 minutes or so of BTI. That took the hour. It was really well received by those that attended. They were quite impressed, and all were clamouring to see more. They followed us down to the main hall, where all of the exhibitors were set up, and we sat at the autograph table for an hour, meeting people, answering questions, enjoying all of the costumed attendees and generally enjoying the scene... plus, yes, we did sign some autographs. Our first-ever cast autograph! Actually, it was my first autograph of any kind, ever. Same for Travis. ... here's Trav and I, mere moments after signing that mini-poster. I said to Travis, "We're official now! Selfie time!" Jeff, me, Travis, Jess, Tanya, Travis' wife Alex, and the Great and Powerful Marc Biagi. We met a handful of very enthusiastic fans, made a few (hopefully beneficial) connections, and left smiling. 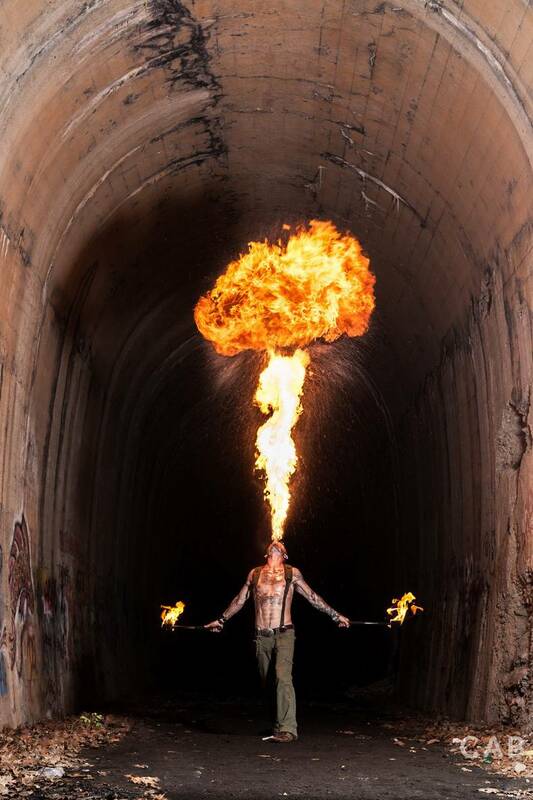 A few days later, TG Geeks (a science fiction podcast) posted an interview with cast member Marc Biagi (pictured above), about BTI and about his career on stage and doing voice work, etc. It's a great interview, if you want to give it a listen. Marc even talks about the day he and I auditioned for BTI together. The same podcast just interviewed Jeff Patton a few days ago, and it will post in a week or two. They are quite enthusiastic in their support for BTI - it's so humbling and exciting. They even want to do a cast interview in September for the podcast. Speaking of BTI, the script meetings we've been having have been AMAZING. O man o man o man... wait until you see what we bring next. We've mapped out the entirety of the web series, all the way to the conclusion. It will be a mammoth script, crammed full of scenes that already are competing with each other to become my favorite. Trust me, Jeff (and I, to a lesser extent) has come up with an incredible story. The current plan is to flesh out the outline over the next few weeks, then let Mike do the script break-down, have table reads, rehearse, line up locations, and film in September/October. Hopefully, we'll have the new episodes start rolling out by the holidays. We'll be launching a Kickstarter for the project soon. Plus, other stuff I can't talk about yet. As far as Comicon, we had representatives and cast members dressed in BTI T-shirts passing out materials. We've seen a HUGE spike in people watching the episodes as a result - and likely also because of Marc's interview at TG Geeks. We're gaining momentum! The other web series I'm writing for is a labor of love by my friend Rob Dey - the series is called Momentum. It is a surprisingly deep story, with cool characters, lots of action, and great potential. It's unclear to me at the moment whether the series will go into production or not, but for the time being, I'm treating it like a writing project. And I'm enjoying it greatly. 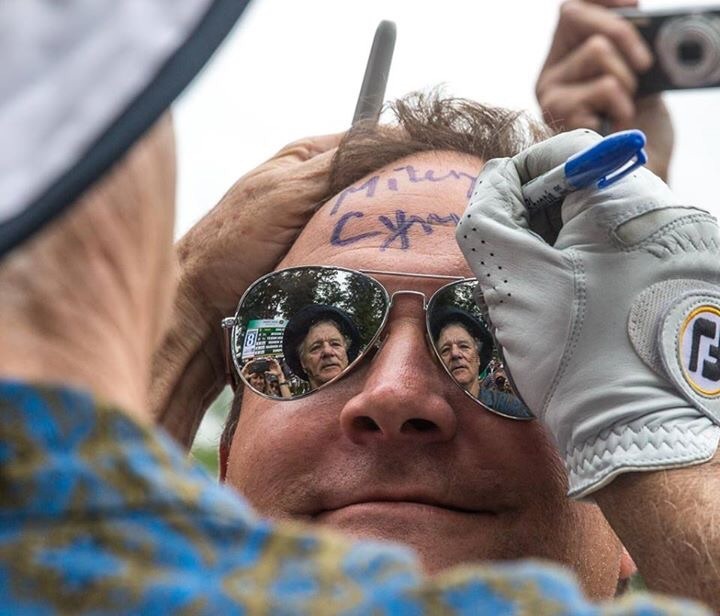 This is a photo of Bill Murray autographing a fan's head at a golf tournament, with permanent marker. As you can see, he's signing "Miley Cyrus"... lol. Bill Murray is my hero. It was SOO MUCH FUN. They went over a few standard objections for me to use at various points - and since were weren't recording audio, it didn't really matter if the objections made sense or not. We were getting video imagery only, and they were going to record narration to go over the video in editing. I wish I'd known that I was going to play the defense attorney before I arrived that day - they just told me when I got there that I would be defense attorney. I would have researched all the objections and been better prepared. I'm taking a break from the LA acting classes for a month. Did I ever talk about the one-day workshop that Rob Adler did down here in San Diego? If I didn't, the short answer is, it was incredible. I loved it. There were a dozen of us there, and from what I can tell, we all enjoyed it tremendously. Also, the steampunk script I wrote is beginning to be shown around locally. If/When anything comes of it, I'll let y'all know. So, Dave, How Did the 48 Hour Film Shoot Go?